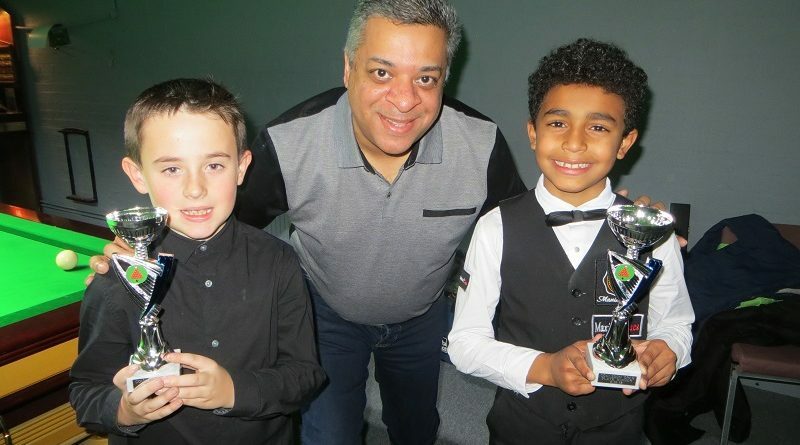 TWO nine-year-olds contested the Plate final during the fourth legs of the Cuestars Under-21 Gold, Silver and Bronze Tours at Frames Sports Bar, Coulsdon. Silver Tour player O’Shay ‘The Angry Wasp’ Scott (Eastleigh) defeated Will Kempson (Salisbury) to claim the winner’s trophy. Kempson, who collected his first Cuestars trophy, had finished joint third in his Bronze group in his fifth tournament but missed out on qualifying for the knockout on frames difference. Chandlers Ford Snooker Club hosts the fifth leg of ten on Sunday, January 6. For more information about the event sponsors, visit www.framessportsbar.co.uk and contact Mr Gold via [email protected] or ring 07930 355677. PRELIMS: Chloe White (Waterlooville Sports Bar) beat Dean Russell (Waterlooville Sports Bar), Louie Leighton (Basildon SC) beat Jaydon Elliott (147 SC, Swindon), Samuel Laxton (Waterlooville Sports Bar) beat Sam Walter (Mayfair, Gosport), O’Shay Scott (Chandlers Ford SC) beat Taylor Elliott (147 SC, Swindon), Eddie Mason (Salisbury SC) beat Zak Truscott (Waterlooville Sports Bar). QUARTER-FINALS: Chloe White beat Leighton, Scott beat S Laxton, Callum White (Waterlooville Sports Bar) beat Mason, Will Kempson (Salisbury SC) beat George Laxton (Waterlooville Sports Bar). SEMI-FINALS: Scott beat Chloe White, Kempson beat Callum White. From left: Will Kempson, Frames owner Tony Thompson, O’Shay Scott.